PLEASE READ ALL LISTING DETAILS PRIOR TO PURCHASE! ALL SALES ARE FINAL! THERE WILL BE NO CANCELLATIONS OR REFUNDS ISSUED! 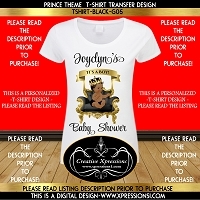 Wow your guests with this t-shirt design to match other personalized items from Creative Xpressions. Please don't purchase this design and then request changes from it. The price shown is for this design only. Iron-on fabric transfers is to be adhered using an IRON (instructions will be included with your order). Heat Transfer is to be used with a HEAT PRESS machine. Please allow 3 business days for processing and shipping printed transfers (after PROOF approval)! Please allow two weeks processing/shipping time after PROOF approval for printed t-shirts. If you need sooner please inquire prior to purchase.